The flag of National Olympic Committee of the Republic of Uzbekistan is white with logo. Text from http://www.capitals.e-allmoney.com/asia/uzb.html: "A flag Tashkent the rectangular panel of white colour in which centre the round urban arms are seated is Modern. The coat of arms cities represent round east board of dark blue colour in which centre the arch of blue colour with open gold east collars is possessed. In the arch centre the stylised plotting of three mountain snow tops of dark blue colour and a round gold flat cake over them is seated. Under an arch the green tree a plane tree which trunk is bent around by two white rivers places. 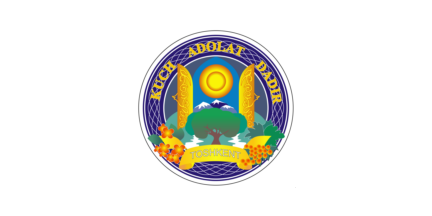 On the top extremity of a board gold Latin letters trace the motto «KUCH ADOLAT DADIR» - «FORCE In JUSTICE». In arms bottom the gold arched tape with the city name (letters Latin, grey colour) is represented. The tape ends decorate on the one hand an orange bunch with green leaves, with other - orange flowers of a clap. The flat cake, a clap and grapes personify agriculture, the earth and work; snow tops and a plane tree - the nature of Tashkent. Date of an official confirmation of the coat of arms of Tashkent became on April, 21st, 1909"